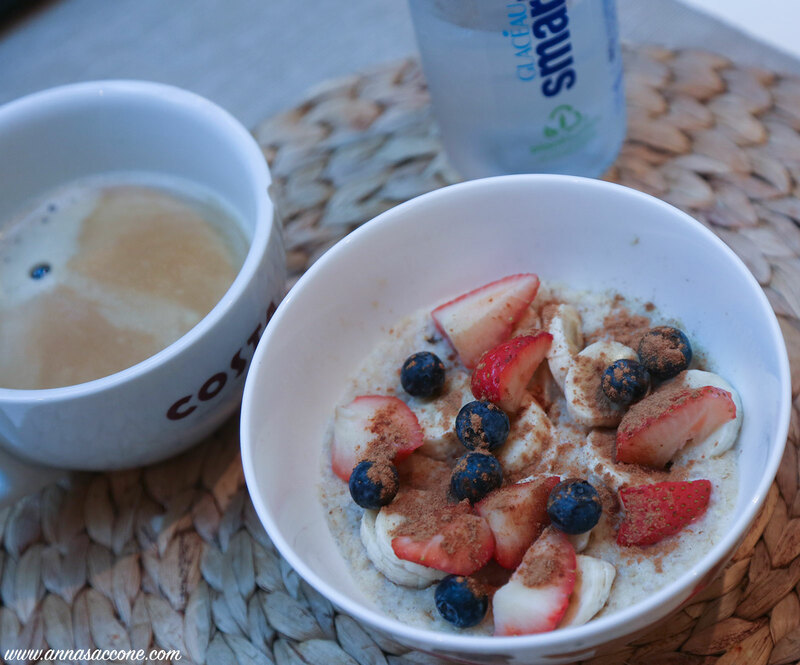 Today was a dark and gloomy morning so I added some vibrance with a few summer berries in my porridge! I know strawberries are technically out of season now but I have been craving them so I bought some organic ones in our weekly shop (most of which have already gone bad) to add to my breakfast. I had my usual staple of porridge with almond milk, 1/2 banana, blueberries and a sprinkling of cinnamon. Of course I also had a cup of black coffee along with a bottle of water. My lunch was an old favourite of mine; I used to eat this all the time when I was pregnant with Emilia! 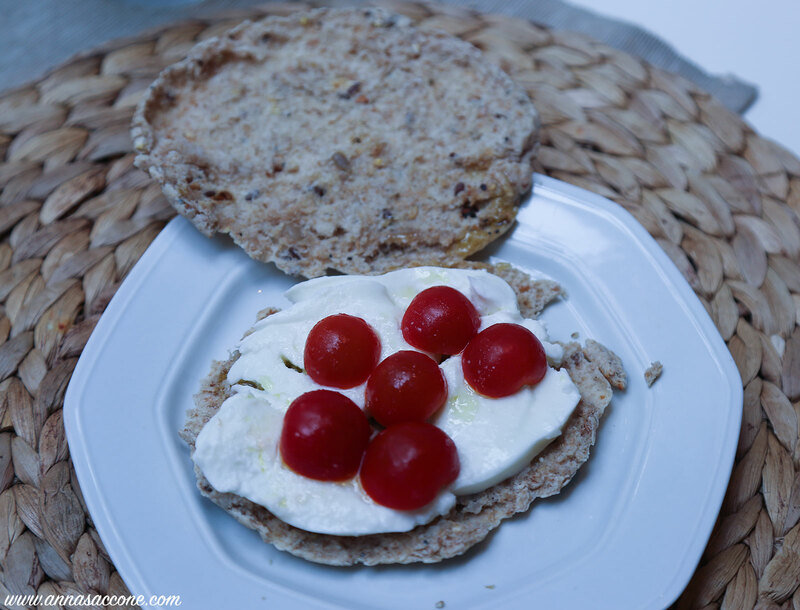 It consists of a wholewheat pitta with mozzarella (I use half a ball), cherry tomatoes, salt and a drizzle of olive oil. I also drank another bottle of water as I had a workout session with my trainer. We do about 30-40 minutes (realistically about 10 of those minutes are spent catching up on girly gossip!) of HIIT: high intensity interval training. After my session I am always POOPED! 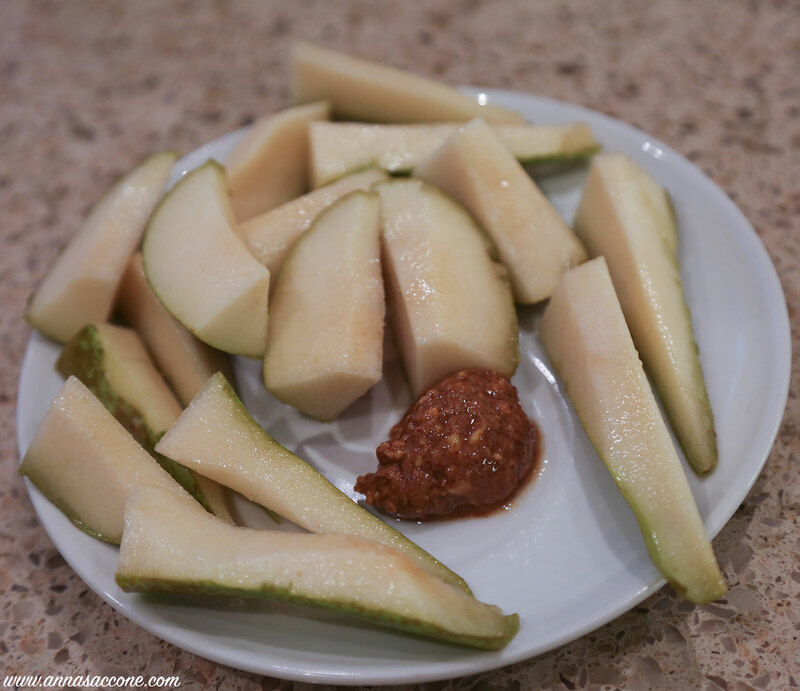 That afternoon I had a little pick-me-up snack of a large pear (I bought these for this week's cupcake recipe!) and a teaspoon of almond butter. I figured pear and almond must go together if they're almost always in tarts, right?! Ha ha! 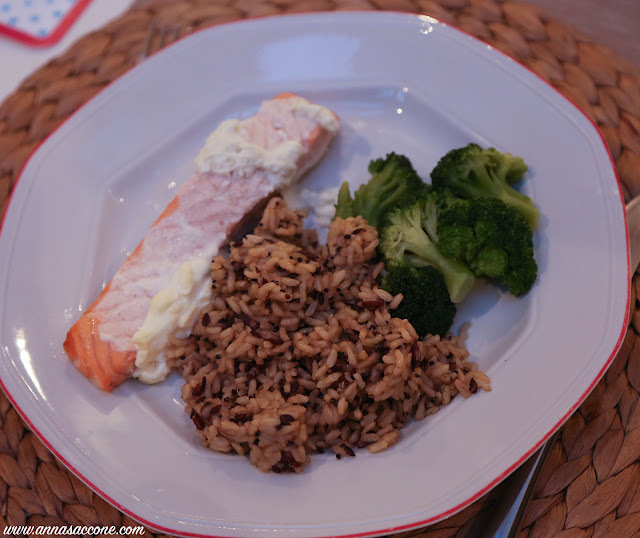 For dinner I attempted a new salmon recipe I adapted from one of Lucy (my trainer)'s videos. It was so good! I smeared low-fat cream cheese mixed with coconut and lemon juice over salmon fillets, then wrapped them into foil parcels and baked them in the oven for 25 minutes. I served them up with some wholegrain brown rice & quinoa and steamed broccoli. I loved this meal, the kids were fans of everything except for the broccoli (no surprises there) but Jonathan wasn't keen :( He is very fussy when it comes to trying new foods which can be very difficult! After the kids had gone to bed for my little evening treat I had a big bar of chocolate (Cadbury's Dairy Milk...the best!) and I made a caffeine-free almond milk latte which is basically just a fancy way of saying I had hot milk. Ha ha! We have a frothing machine to go with our Nespresso and I use it to make frothy lattes but since I don't drink coffee in the evenings anymore I just make them with milk. 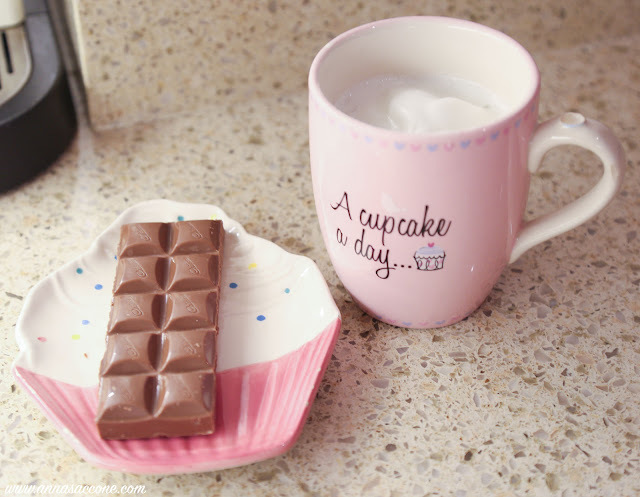 Almond milk actually froths up really well and I then dip the chocolate into it so it melts...mmm! Delicious comfort food perfect for eating while snuggled up watching TV. I also drank 2L water today *pats self on the back*. I find this easier on the days that I workout with Lucy because I sweat so much! What did you eat today? This is possibly the most inappropriate outfit for the current weather we are having at the moment but sometimes you just need some pastels in your life! Also, do you ever just wake up in the morning feeling like pink jeans are calling your name? No, just me then. This Tommy Hilfiger shirt is about 1,000 years old but it just goes to show how long classic pieces like these last in your wardrobe! The jeans are by Fiorucci and still remain one of my favourite pairs. I wouldn't typically wear boots with this outfit but since I had no choice about braving the outdoors while doing the pre-school run I threw on my trusty suede H by Hudsons. Aaaand sucked everything in / tried to avoid being touched by all car doors entry-ways. Like I said, very bad outfit choice! Autumn is officially upon us so I've been easing my way into the woollier section of my wardrobe! This knitted Maje jumper is a great between seasons piece as it's cropped and not too heavy so it's good for that summer - autumn transition time. I've been loving high-waisted and cropped combinations lately so these Ted Baker ripped jeans went perfectly with the jumper. I teamed it all up with my trusty brown H by Hudson boots from last year; these are probably my most-worn pair! I also uploaded a video in which my personal trainer Lucy & I show you how to do an at-home work out with your baby/toddler! We wanted to create something for all my fellow stay-at-home mummies out there who don't get a lot of time to themselves. This was hectic and a bit all over the place with two active little ones but I was sweating buckets by the end of this video! And the best thing is you don't need any equipment, you can do it from the comfort of your own home and it's a fun activity to do with your kids. Hope you enjoy!